It was a crisp and breezy evening in Ventura, but the warmth and sense of community was well represented. Over 100 proud citizens of Ventura County attended the Dinner at the Mission on Thursday, July 26th and, it’s fair to say no one was disappointed. 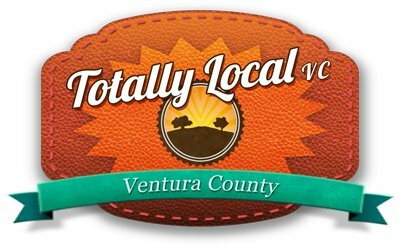 Proceeds from the event benefitted FOOD Share of Ventura County, which definitely elevated everyone’s energy and smiles throughout the night. Always highlighting local venues and landmarks, Totally Local VC selected the historic San Buenaventura Mission to serve as the backdrop for the 2nd event in the 2012 Dinner at the… series. It is a beautiful venue that showcased the history and origins of Ventura. Attendees were treated to passed hors d’0euvres and beverage tastings* in the courtyard followed by tours of the chapel, Fr. Tom Elewaut’s home and Hotel Washington. After the tours, which were led by wonderfully friendly and knowledgable docents who could have blanketed the guests with facts and history for hours, it was time to convene for the meal. Everyone gathered at a long communal table staged between the fountains across the street, under the watchful shadow and gaze of the Mission. Thankfully Ventura County is incredibly blessed with culinary talent and fantastic agriculture, which facilitated a bountiful menu selection. The county is also jammed with enthusiastic foodies who appreciate a flavorful and creative meal. Chef Tim Kilcoyne, Executive Chef of The Sidecar Restaurant, and his sous chefs delivered just that, hinting at delights to come beginning in the courtyard with pickled young figs, oysters, and curried eggplant crostini. Main dishes, all sourced locally, provided combinations of sweet, salty, rich, earthy, land and sea, complimenting textures and much more. The night wrapped up with full bellies, new friends and a sense of pride for the community that all of us in attendance are happy to support. *A huge thank you for the evening to Kat Merrick, Chef Tim Kilcoyne and his kitchen staff, members of the San Buenaventura Mission, all of the FOOD Share volunteers and the wonderful Ventura vendors who helped make the evening possible. Gallery | This entry was posted in Events, Food Vibrance and tagged Dinner at the..., Figs, FOOD Share, Mission, Totally Local VC. Bookmark the permalink. Thank you so much for this wonderful capture of our very special evening. We are so thankful to have great partners n our community like FOOD Share and Everybody’s Hungry.